R4-P17 is a Star Wars themed astromech droid introduced in 2002. R4-P17 in Obi-Wan's red Eta-2 Jedi Interceptor. R4-P17 first appeared in the Episode II: Attack of the Clones subtheme in the 7143 Jedi Starfighter set, released in 2002. 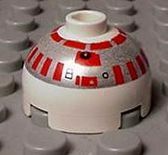 In this appearance, the droid used the same head piece as R4-D5: a white piece with silver, red and black printing designed to look like an astromech droid's dome. The headpiece was mounted onto the side of the Jedi Starfighter included in the set. Three years later, R4 was released as a part of the set 7283 Ultimate Space Battle from the Episode III: Revenge of the Sith subtheme. 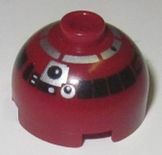 In this set, R4's head was given its own unique design - a red part with black, silver and white printing, and represented R4's appearances in the films more closely. In 2010, a 4x4 maroon half-sphere representing R4-P17 was released. This piece was made larger than a minifigure, as the set it was released in, 10215 Obi-Wan's Jedi Starfighter, is an Ultimate Collector's Series set, and scaled larger than minifigure scale. In this variant, she has dark silver printings showing all of her head panels and sensor eye. R4-P17 was next released in 2013. In this variant, the droid has a maroon head with printings, as well as a white body and legs, making it the first time R4-P17 has been released as more than just a head. The printings on the droid are similar to other astromech droids, but with slightly different panels and different colours, predominently in dark red. R4-P17 has appeared in three video games to date: LEGO Star Wars: The Video Game, LEGO Star Wars: The Complete Saga, and LEGO Star Wars III: The Clone Wars. 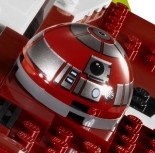 In the first two games, R4 has the same appearance as R4-D5, except the head piece is the same as R2-D2's but colored red instead of blue. The body is white and has silver, black and red printing, representing several doors and compartments typically found on astromech droids. In the game, R4 is able to open certain doors only accessible to astromech droids, and is able to jetpack across long distances. 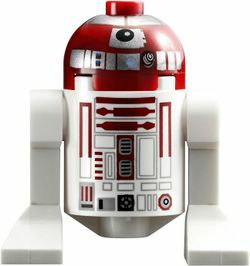 In LEGO Star Wars III, however, R4-P17's body and legs are dark red, with white panels and accents. R4 also retains all abilities seen in the previous games. R4-P17 was Obi-Wan Kenobi's red astromech droid. R4 piloted Obi-Wan's Delta-7, Delta-7B and Eta-2 Jedi Starfighters. She was originally hard-wired into Obi-Wan's Delta-7; however, when Obi-Wan acquired his Delta-7B Starfighter, R4 received a standard astromech body so as to function with compatibility for the new starfighter. R4-P17 was destroyed in the Battle of Coruscant in Obi-Wan's red Eta-2 by Buzz Droids. The head of R4-D5 was used to represent R4-P17 in the 2002 edition of Obi-Wan's Jedi Starfighter. In LEGO Star Wars: The Video Game, R4 does not appear in the Episode III segment in Obi-Wan's fighter; rather, a copy of R2-D2 takes her place. This mistake was corrected in LEGO Star Wars: The Complete Saga. In the set 10215 Obi-Wan's Jedi Starfighter, a dome-shaped piece features printing to represent R4-P17's head dome. This piece is much larger than a standard Astromech Droid head, due to the scale that this UCS set is built on. Although R4-P17 appeared in Episode II missions in the video games with a body, in the Star Wars universe, R4-P17 did not receive a body until after the events of Episode II. In LEGO Star Wars II: The Original Trilogy, R4-P17 can be acquired by using the old save data option in-game. This page was last edited on 21 September 2017, at 04:22.